Music is a type of art that is not easy to master. If your child is playing music in a better way, you should appreciate him. Music skills are learned through practice. To be able to play the music effectively, you are required to learn the music playing skills. If you are making your child learn music skills and he is doing much better, he should be appreciated so that he can be encouraged and can do even better than that. Giving your child a music certificate is always the best way to appreciate him for all his efforts. When to give the music certificate? If your child has done his best in the music class and you feel the need to recognize the efforts of your child, you don’t have to buy a gift to do so. 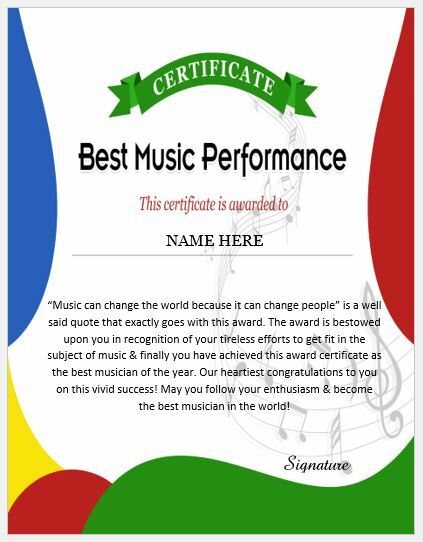 You can simply get a music certificate to award your child with. What is the benefit of awarding music certificate? The certificates always give happiness to your child because they feel their efforts are being acknowledged and recognized. In addition to it, the music certificates are also very beneficial for the child if he wants to pursue a career in the field of music. 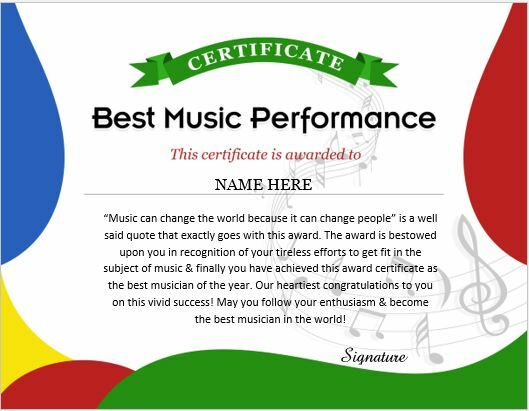 A printable template for music certificate can be downloaded from this website. This template is used for all those people who want to save their money and time. This template enables everyone to edit the certificate and make it appropriate for them. You can add the name of the recipient in the certificate and the reason for awarding it. You can put your own details along with your signatures at the end of the certificate to make it a legitimate document. You can download this beautiful design music performance certificate for FREE! You can customize the details of the certificate easily. Following are given a number of wordings that you can pick and put into the certificate as per your requirement and choice. For this, you can simply select the text and replace it with the one you like from the given list. This award is proudly presented to [name of the recipient] for the excellence displayed in flute in the competition named, “If music is the food of love, play on”. He\she performed extremely well in that genre. Congratulations! Music achievement certificate award is presented to [name of the recipient] in recognition of his\her mind-blowing success in the subject of music. He\she gave his\her best to get this award of achievement. Many congratulations on an outstanding performance! “Music can change the world because it can change people” is a well-said quote that exactly goes with this award. The award is bestowed upon you in recognition of your tireless efforts to get fit in the subject of music & finally you have achieved this award certificate as the best musician of the year. Our heartiest congratulations to you on this vivid success! May you follow your enthusiasm & become the best musician in the world! This award is presented to [name of the recipient] in recognition of his\her outstanding & extraordinary skills in the music competition held at our institute [name of the institute]. He\She was outstanding in playing the flute & harp. It seemed as if it was a concert & not a competition. He\She well deserves this award. This is a unanimous decision of all the judges out there. Keep up the amazing work! Congratulations!